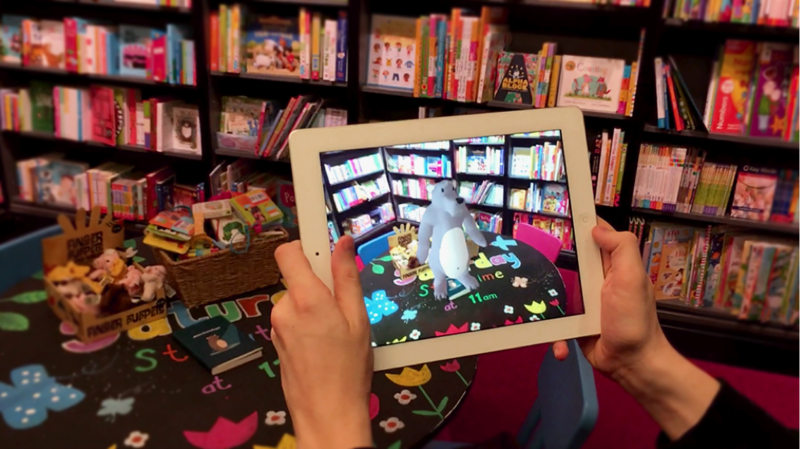 Augmented Reality can bring children's favorite characters to life inside the bookstore. Image via Big Motive. Augmented Reality is by no means the newest (technology) kid on the block. Though it seems that we’re only now tapping into its true potential – to enable us to connect in a more immersive way with the world, brands, and with each other. New Augmented Reality (AR) businesses are popping up everyday. Blippar for example, has more than 65 million users worldwide with over 1,000 brands -- including Coca Cola, Nike, Universal, and Jaguar -- getting in on the act. Super secret startup, Magic Leap has just partnered with Lucasfilm to develop Star Wars related content for their much debated (and still mostly undisclosed) technology. With AR finding use cases across a variety of industries, we at Big Motive got together at a recent design lab to explore industries, sectors, or even businesses where AR could make an impact. We asked: Where can AR make an improvement to the customer’s experience by an order of magnitude? Rather than disrupt, can AR be used to enhance a retail brand or product by applying a digital layer? Can it create a window that leads to a deeper relation with brand or content? The question led us to books. No industry has been challenged and disrupted by technology more than publishing. With the introduction of digital books and readers, the decline of physical book sales was inevitable, but surprisingly not within the age-group one might expect. Between 2010 & 2016, there has been a notable decline in the amount of children reading for pleasure… a drop of nearly 10%. Bookstore AR solves this problem. By greatly enhancing kids’ experience of books at the point of purchase, we imagine a future where bookstores become magical worlds filled with talking books that invite children to engage with content, characters, and stories. An example of how AR could transform bookstores, as imagined by Big Motive. Imagine ‘The Gruffalo’ inviting customers to join him as he follows the mouse through your local bookstore. Imagine ‘Harry Potter’ showing off his Quidditch skills on the cover of The Sorcerer’s Stone or ‘The BFG’ reading the first chapter of Roald Dahl’s classic. AR could transform the way we experience books within the retail environment. The advent of next-generation mobile devices anticipates adoption of AR as a mainstream technology making opportunities like an enhanced bookstore very much a reality. We believe its potential to engage or reconnect kids with stories is enormous -- adding value both in cultural and commercial terms. Bookstore AR is about enhancing our experience of bookstores and our relationship with books. John Cranney is Product Manager at Big Motive, a creative technology studio based in Belfast, Northern Ireland. Previously, John spent ten years working within the Advertising Industry for agencies like Grip Limited in Toronto and TBWA\Manchester.